Updated 4/4/2017 Episode 16 (Bluebeard), cut 272. Bluebeard’s wife has just gone into the forbidden room and found the rotting corpses of her predecessors hanging on hooks around the walls. 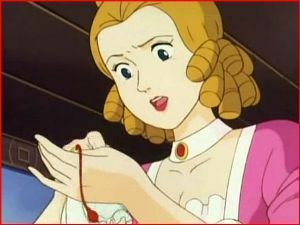 Now she is desperately wiping the key with her handkerchief, which nevertheless continues to exude streams of blood that will soon betray her fatal curiosity to her homicidal husband. This lovely set-up came with full identification on the top of the cel and on the attached layout (first thumb). The episode was dubbed into English like the other "Grimm Masterpieces." But from what I can tell, it was not chosen for broadcast on Nick Toons. A clip of it, happily, showed up recently on YouTube. Screening it shows that Saban's decision was quite understandable, as the episode is quite graphic in showing the corpses of Bluebeard's wives. The adaptors also put high symbolic value on white flower petals that turn red, then ooze into streams of blood, a disturbing and effective image. This episode would certainly give the kiddies nightmares! 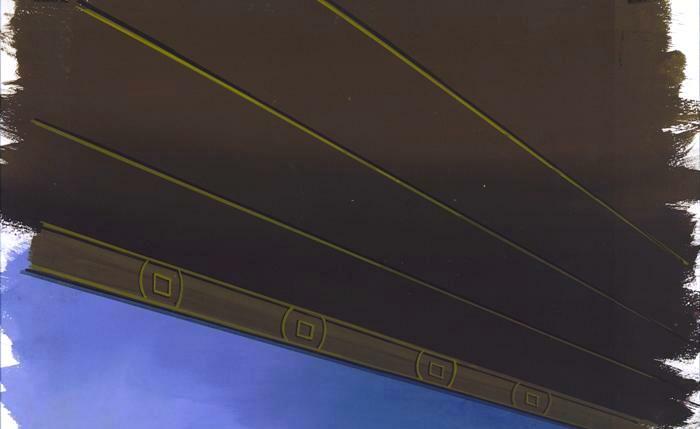 But this set-up is a lovely, haunting dream, with strong trace lines (Nippon Studios evidently used better materials than Toei, as I’ve never seen a badly faded cel from this concern). 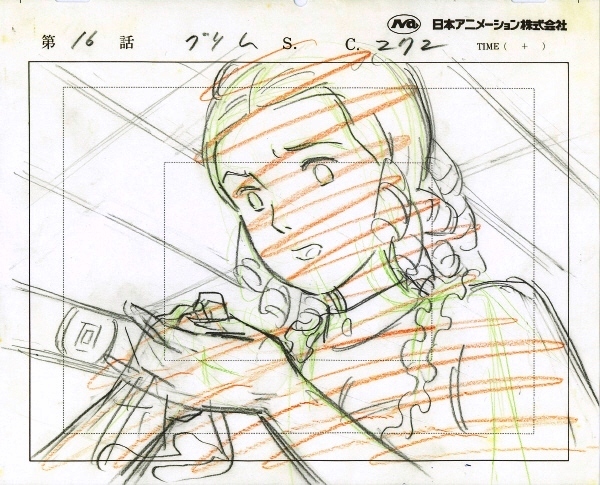 Don't miss the attractive layout (first thumb), executed by character designer/layout supervisor Yasuji Mori. The background is also in fine shape (see second thumb). It is perhaps a niggly academic point that “Bluebeard” is actually not a “Grimm Masterpiece” but is from Perrault’s French folktale collection. However, “Fitcher's Bird” (Grimm #46). has a similar, authentically Grimm scene with a wife entering a forbidden chamber filled with the dismembered body parts of her predecessors.